more waste-game 2 stuff on WASTE-GAME 2 addt'l. click. For those of you out there who are trying to figure out the byzantine ziggurat's answer this time around, here's some information i've collected. any theories or information may or may not lead to the solution. remember, i'm playing this just like you. This page can be accessed a few different ways. ...and so seven ships were set adrift under the wondering eye of Poseidon on a journey to the Island of Crete to fulfil the Legend of the Minotaur. So, these seven ships are it. 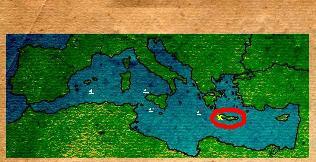 1) Each one of the boats will dock at a certain time and place... Boat 1 docks at Crete... I think the others docked already but we missed it. 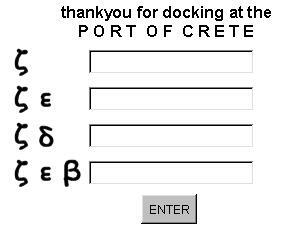 2) Each one will stay for 10-15 minutes... and will sail for about 2 hours (or more)... you can only enter a password while it's docked... (like the Crete one just left). 3) We must decrypt the code on the boats... it's probably some kind of word game, where greek letters stand for english letters... in some way.... i don't think it's mathematical, cause maxk had been asked to put a less mathematical game this time. And it must be connected with the story at www.waste-game.com . - Wave one hides 1 letter. - Wave two hides 2 letters. - Wave three hides 2 letters. - Wave four hides 3 letters. I and k Peterzell translated it. For the other ships. Look at the translations made by paul. stand for the words, but are mixed together. click on map next to byzantine empire. click on map next to black sea. I don't know if means anything or not but if you compare these map to the waste game map you will notice that on the waste game map it shows land where the Black sea and the Sea of Marmara is supposed to be and Constantinople which is the capital of the byzantine empire(Istanbul present day) is right at the inlet where the two bodies of water meet I think this called the Bosporus.And the Sea of Marmara is connected to the Aegean sea by the Dardanelles straits. Anyway I don't know if this is helpful but just thought I would send this in. maybe the translated numbers MIGHT have to do with those? Crete has the red oval around it in the map below. The yellow "x" is approximately where ship1 docked earlier, and passwords could be accessed then by clicking on the ship. Link to translate greek alphabet (for letters on sides of ships). The greek alphabet can also be translated into a number system - click. the ships remained at Crete for about 5-15 minutes then left.